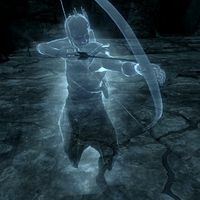 The Ghost Adventurer, a Nord archer, is one of the ghostly appearances outside of Rannveig's Fast. He is accompanied by several Subjugated Ghosts and is forced to attack you against his will. He wears randomly determined light armor which includes a pair of boots and a 50% chance of a pair of gauntlets. His outfit may not be a matching set, as it can be a mixture of fur, leather, scaled, hide, or studded versions, depending on your level. He wields a leveled bow and has a chance of carrying leveled arrows, as well as a leveled dagger. He also carries random leveled loot and a small amount of gold. "Stay back or I'll be forced to attack you!" "Is someone there? Stay back! I don't want to attack you." "I'm sorry! This isn't what I want!" "I don't have any choice! I'm sorry!" This page was last modified on 14 April 2013, at 15:26.